An engineering consultancy, called Expedition, has proposed a new high-speed railway passing both Gatwick and Heathrow, starting at the HS2 line near Denham north of Heathrow, and ending at Ashford in Kent. Expedition says it is called HS4Air and the plan has been developed to enhance other major infrastructure projects for the south east. It would cost £10 billion and would connect the existing HS1 rail line with the planned HS2 along a route that passes via London’s biggest airports. Alistair Lenczner, director at Expedition leading the development of the HS4Air proposal, said discussions are currently ongoing with a number of interested parties, spanning both national and regional bodies. The line would be 140km long, and about 20% of it would run in tunnels – to avoid too big an environmental impact. Around 40% of the route re-uses the existing Network Rail railway between Tonbridge and Ashford. Expedition hopes that HS4Air would allow rail and aviation infrastructure projects in south east England that are currently unconnected to become joined-up, and mean rail passengers would be able to travel to both airports on “fast regular services” from cities such as Birmingham, Manchester, Leeds and Cardiff without needing to switch trains. A new proposal for a new high-speed railway passing both Gatwick and Heathrow has been developed to enhance other major infrastructure projects for the south east. 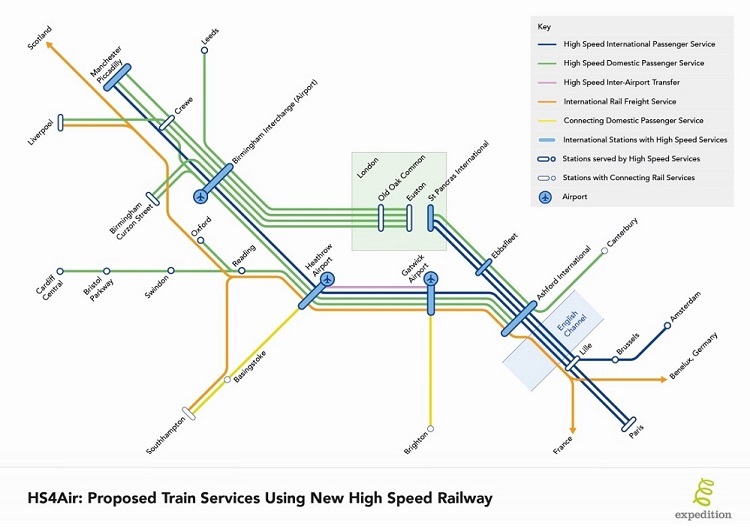 Engineering consultancy Expedition today revealed its £10bn plan for HS4Air, which would connect the existing HS1 rail line with the planned HS2 along a route that passes via London’s biggest airports. Alistair Lenczner, director at Expedition leading the development of the HS4Air proposal, said discussions are currently ongoing with a number of interested parties, spanning both national and regional bodies. How would the M25 for high-speed trains work? In a way HS4Air can be regarded as a high-speed railway version of the M25 around London, except that it allows much faster journey times with no congestion and with far less impact on the environment. The planned railway would provide fast direct access to both Gatwick and Heathrow airports from major UK cities to the north and west of London. Rail passengers would be able to travel to both on “fast regular services” from cities such as Birmingham, Manchester, Leeds and Cardiff without needing to switch trains. Expedition says it will also slash journey times for passengers travelling between places south of London and towns in the Midlands. It wants a 15-minute surface transfer shuttle between Gatwick and Heathrow using high-speed shuttles between airport stations on the HS4Air railway. Lenczner said the proposal was an example of integrated strategic planning that spans across multiple infrastructure sectors that “are too often planned within their separate ‘silos'”. Expedition envisages the proposal alleviating pressure on the M25 and the number of domestic flights involving Heathrow and Gatwick. A London-based engineering consultancy has proposed a transformative high-speed railway which would connect the major airports of the UK and enhance current transport infrastructure projects planned in the south-east. Expedition has unveiled its plan for HS4Air, which connects the existing HS1 rail line to the planned HS2 rail line along a route that passes via both Gatwick and Heathrow airports. The project would also provide fast and direct rail access from major cities north and west of London including Birmingham, Manchester and Cardiff, while “dramatically reducing journey times”. Those behind the proposal estimate the cost to be approximately £10bn and would provide relief for London’s rail network, on the M25 and the number of domestic flights involving Heathrow and Gatwick. Expedition director Alistair Lenczner, who has led the development of the HS4Air proposal, believes the proposed network would provide better value for investments currently being made in the UK. The director presented his vision for HS4Air this week at an event held at the Institution of Civil Engineers. “HS4Air has been developed to allow rail and aviation infrastructure projects in south east England that are currently unconnected to become joined-up,” Lenczner said. “In a way HS4Air can be regarded as a high-speed railway version of the M25 around London, except that it allows much faster journey times with no congestion and with far less impact on the environment”. The proposed HS4Air project is an example of integrated strategic planning that spans across multiple infrastructure sectors that are too often planned within separate “silos”. The 140km long proposed network would run between its connections with HS1 at Ashford and its proposed connection with HS2 near Denham. Approximately 20% of HS4Air would run in tunnels to avoid adversely impacting on environmentally sensitive areas such as the Surrey Hills. A 15-minute surface transfer shuttle time between the airports using dedicated high-speed shuttles has also been identified as a benefit on the HS4Air railway. The fast and frequent shuttle services would make it possible for passengers to make convenient and reliable transfers between Gatwick and Heathrow and for airlines to share operations between the two airports. Expedition has been responsible for major projects like the London Olympic Velodrome and the Infinity Bridge in Stockton-on-Tees. It now hopes to continue preliminary talks with interested parties both nationally and internationally. Posted: Monday, March 12th, 2018. Filed in Blog, General News, News about Airports, Recent News.